Camryn and I created a rectangular wood lamp with circles cut in it to show light. The most challenging part of this project was making the wood box fit together and glue it at the same time. We ended up using rubber bands to make everything stay interlocked. There were a few times when things didn't work as expected. First, our original design showed the lamp being almost twice as large as it is now. When we were about to cut it out, we realized that the pieces would not lock together and overall form the rectangular shape we wanted it to. We solved this issue by building our box pieces on a different program called Maker Case. We used the format which made a box with notches on the edge that would interlock. This project was really fun. I had never really designed and built something that would actually have a purpose and work. It was really fun in the second to last class where there was a mad dash to get everything done. I was cutting paper, wrapping lights, and gluing wood and my fingers. When we got one of the lamps mostly finished, it was really satisfactory and fun to see the end result. I learned a lot while doing this project. First, I learned about new tools. I was very inexperienced in the new technology, so I had to learn how to make laser cutting plans and how to design 3D printing objects. Next, I had to learn how to really focus on getting one thing done at a time. There were so many parts to this project before assembling everything that I was constantly switching back and forth between different activities. I think that if I had focused on getting one part done during each class period, I would have been more efficient. Finally, I learned how to truly work as a team, not just fill in a paper together. Camryn and I had to learn to work quickly together and still have the end result look good and function well. We communicated face to face and over email. When we were actually working together, we found a way to be doing separate things that would correlate or join at the end. We fell into a rhythm that helped us work. We didn't use many new strategies, the only one being using a Maker Case instead of the regular laser cut design website called Adobe Illustrator. If I had more time, I would've wrapped the LED strips more evenly around the cardboard cylinder. I also wish I could've designed a better base for my lamp in 3D Design. Using the Hummingbird kit, Camryn and I created a stoplight and a car. We mad the car out of play-dough, popsicle sticks, a heat sensor and green and red LED lights. We made the car out of plastic, two motors, two 3D printed wheels, two rubber wheels, and a distance sensor. If I were to do this project again, I would improve the back wheels of the car so that they would spin better. Currently, they help mostly with stability. I would also improve the balance of the stoplight because it was a lean to it and sometimes falls over. We could've 3D printed a base that would make it stay up straight. In Creator's Studio this week, I created a name tag that can be attached to luggage or used as a zipper. I made the piece by first making a rectangle approximately 2.5 inches long. Then I place another smaller rectangle inside the larger object and made it a hole, so that it was like a box without a lid. Next, I selected a shape generator of the text, and made it spell my name, Anna Owens. I changed the font and placed it in the hole in the box. Fifth, I put a "Torus" or ring-shaped object on the side of the box so that the name tag would be able to be attached to a bag. Lastly, I aligned all of the shapes so that they would be evenly spaced and lined up and grouped the to make them become one object. 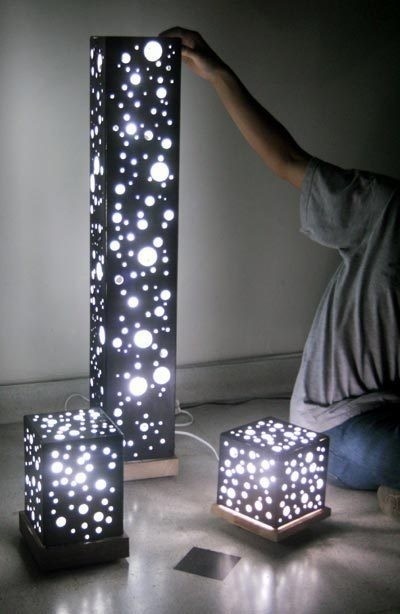 In Creator's Studio this semester, I would like to build a tall night-light made out of laser cut wood panes with different sized circles cut in it. I would like to do this project because I have always been interested in using circuts to put power into a light. This is facinating to me. Also, it would be very interesting to be able to laser cut wood into perfect circles, something I could never do by hand. I will have to research how to actually connect the circuts to make the light bright, and find a way to get that energy: battery, solar, plug in the wall, etc. Also, I have never laser cutted wood, so I will have to learn to do this as well. To make this night-light, I will need several panes of wood, a tall LED light, circuts, and black paint. In conclusion, I am very excited to start this!